Landscapes and architecture of Rome in May of 2011 including night shots of the sites in the city, the Vatican, and the ancient city. 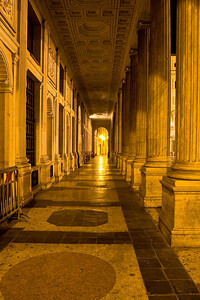 A colonnade in Piazza Colonna, near the Column of Marcus Aurelius. The piazza in front of the colonnade faces Via Del Corso, the main road from the Aurelian Wall at Piazza del Popolo to Piazza Venizia next to the Trajan Forum. Looking down from Capitoline Hill toward Fontana di Piazza d'Aracoeli. 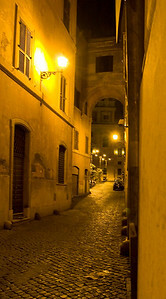 A narrow alley somewhere near Palazzo Barberino. 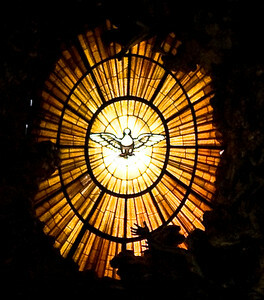 The stained glass window behind the altar at the Vatican. This window was designed by Bernini, the Baroque master. 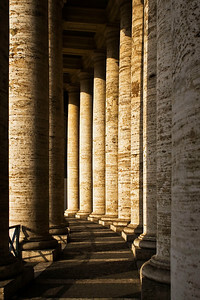 Columns define the boundaries of the Vatican piazza. 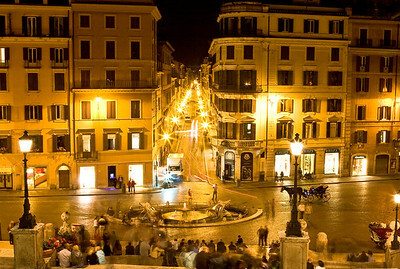 Piazza del Campodiglio at the top of Capitoline Hill. 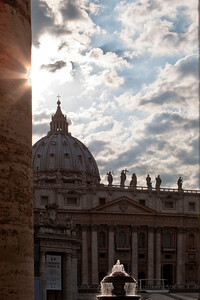 Saint Peter's Basilica in the high contrast afternoon sun viewed from behind a column in Vatican Square. 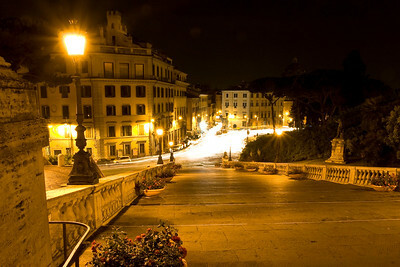 Looking down at Piazza Espagna - The Spanish Steps. 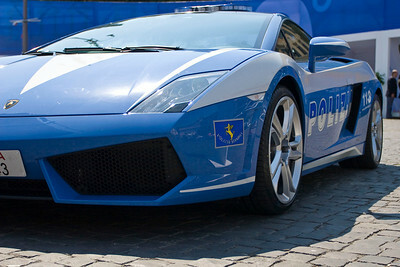 The Rome Polizia were showing off some really nice wheels. It would be hard to outrun this Ferrari. This was part of an exhibit that the Polizia had set up in Piazza Del Popolo on the western end of the old city near the Aurelian Wall. 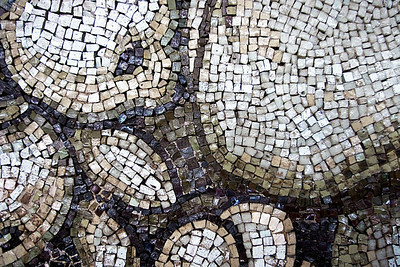 A detail of one of the mosaics in the dome of Saint Peter's Basilica. 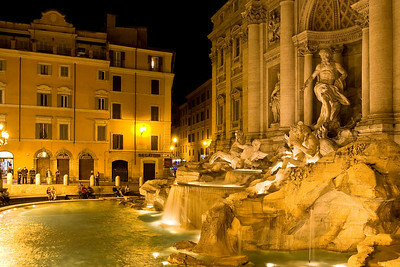 The Trevi Fountain at night. 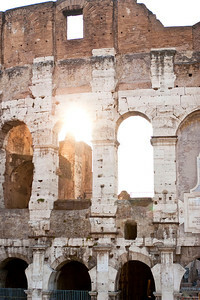 The sun shines through one of the arches in Colosseo, the Roman Colosseum, near sunset. 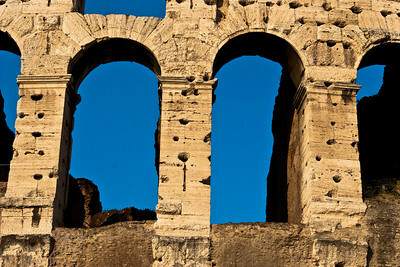 Late afternoon at the Roman Colosseum. 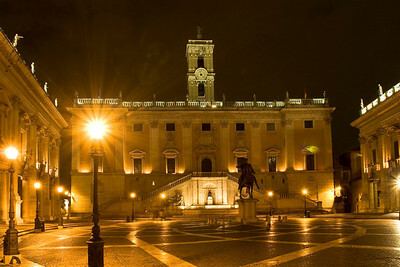 Looking up the walk toward Capitoline Hill at night. 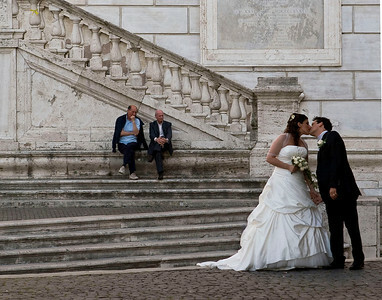 A newly married couple kisses in the piazza. 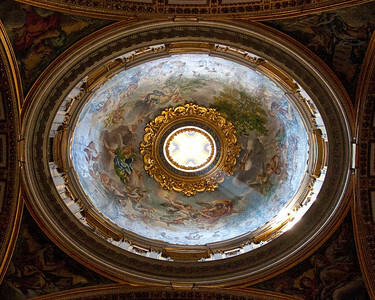 One of the domes within Saint Peter's Basilica. The main dome above the altar in Saint Peter's Basilica. 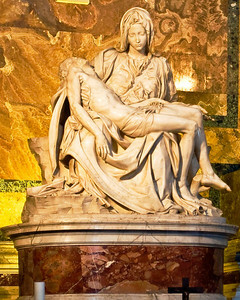 The Pieta by Michaelangelo is on the right side of the nave in Saint Peter's Basilica. When I was very young, I saw the Pieta on loan from the Vatican at the 1964 World's Fair in New York. 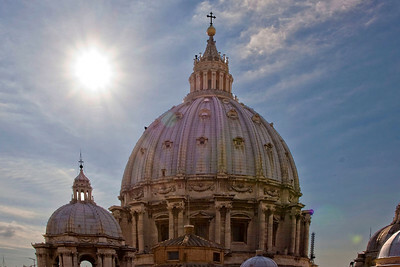 In 1972, a mentally disturbed man attacked the sculpture with a hammer in St. Peter's. Since then, it was repaired and has been kept behind bulletproof glass in Saint Peter's. The glass makes taking photographs difficult. 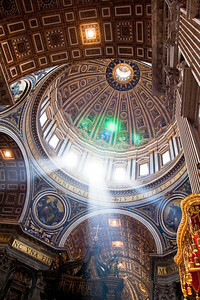 Sunlight shines through the windows below the dome of Saint Peter's Basilica. 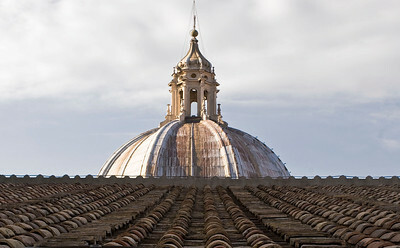 The roof above Saint Peter's rises up toward the dome. 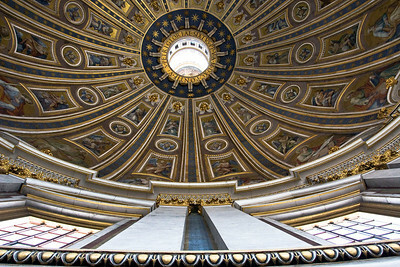 The dome of Saint Peter's Basilica at the Vatican. 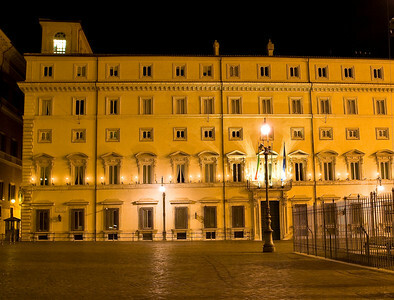 Palazzo Chigi on the north side of Piazza Colonna. This building was originally the embassy of Austria-Hungary. 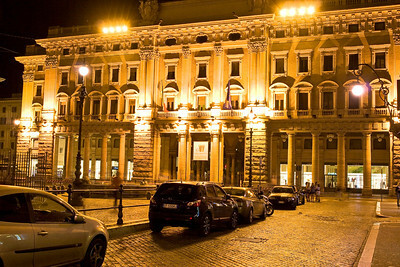 It is now part of the offices of the Italian Parliament which is just to the left. 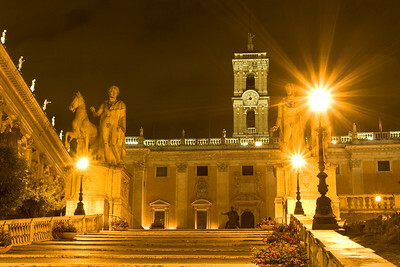 A look at the equestrian statue of Marcus Aurelius in Piazza del Campodiglio at Capitoline Hill. 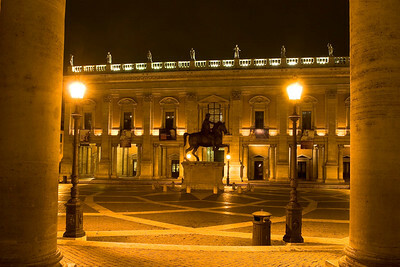 The Galleria on the east side of Piazza Colonna. Piazza Colonna became a favorite walk since the best gelato in Rome is just around the corner past the Italian Parliament at Giolitti's! 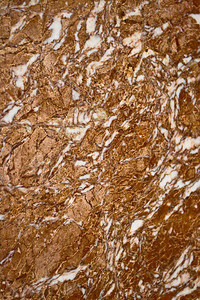 A close up view of the beautiful marble in the columns inside the church of Santa Maria degli Angeli, Saint Mary of the Angels. The church was originally part of the Baths of Diocletian. The church is located at Piazza Repubblica. The oculus at the top of the Pantheon lets in light (and everything else) that reflects inside the circular dome. 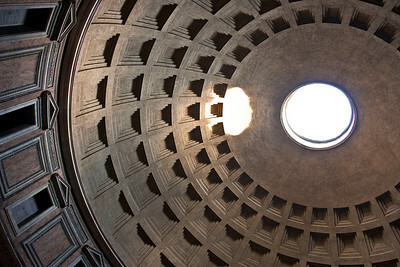 The Pantheon was a wonder of the ancient city and became Brunelleschi's inspiration for the Duomo in Firenze (Florence). A panoramic view of Rome from the cupola at the top of Saint Peter's Basilica. 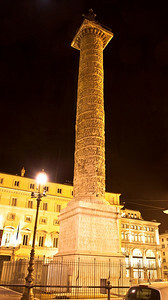 The column of Marcus Aurelius in Piazza Colonna. This column has been standing in this spot since 193 CE.